TERRE Haute, Ind. 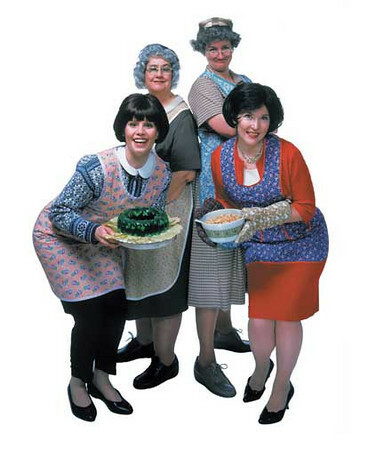 - The hit musical comedy "Church Basement Ladies" comes to Indiana State University's Tilson Auditorium Saturday, April 24 for two shows, at 2 p.m. and 7 p.m.
A celebration of the church basement kitchen and the women who work there, "Church Basement Ladies" is a new musical comedy featuring four distinct characters and their relationships as they organize the food and solve the problems of a rural Minnesota church about to undergo changes in 1964. Between the elderly matriarch of the kitchen, the young bride-to-be, the jack-of-all trades farm wife and the best cook in the church, watch them stave off potential disasters, have fun, share and debate recipes, instruct the young, and keep the pastor on due course. The church basement kitchen throughout much of America is often the heart and soul of any church. Like any great kitchen, problems are solved here as well. During the production, patrons watch the four women handle a Lutefisk Dinner, a funeral, an Easter Fund Raiser, and, of course, a hot July wedding. "Church Basement Ladies," a musical written by Jim Stowell and Jessica Zuehlke with music and lyrics by Drew Jansen has been playing to sellout crowds in Minneapolis. This musical comedy based on recipes, food, and change in the church is funny, heart warming, and down to earth. It will bring back memories of many people you know from churches everywhere. Tickets will be available at the door. Adult tickets are $26 and youth ages 2-12 are $23. Tickets are available at the ISU Hulman Center ticket office, any Ticketmaster location, charge by phone at 800-745-3000 or online at www.ticketmaster.com . Groups of 10 or more are eligible for discounted tickets at $21 each and can be ordered by calling the Hulman Center ticket office at 1-877-ISU-TIXS. The hit musical is coming to Tilson Auditorium April 24 for two shows.